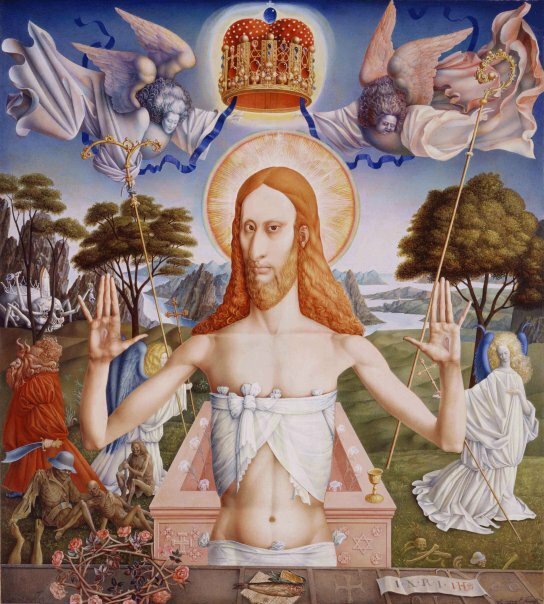 ​Ernst Fuchs (born February 13, 1930) is a multi talented Austrian painter, draftsman, printmaker, sculptor, architect, stage designer, poet, singer, and one of the founders of the Vienna School of Fantastic Realism. He studied sculpture with Emmy Steinbock (1943), attended the St. Anna Painting School where he studied under Professor Fröhlich (1944), and entered the Academy of Fine Arts in Vienna (1945) where he began his studies under Professor Robin C. Anderson, later moving to the class of Albert Paris von Gütersloh. At the Academy he met Arik Brauer, Rudolf Hausner, Wolfgang Hutter, and Anton Lehmden, together with whom he later founded what has become known as the Vienna School of Fantastic Realism. He was also a founding member of the Art-Club (1946), as well as the Hundsgruppe, set up in opposition to it in 1951, together with Friedensreich Hundertwasser and Arnulf Rainer. His work of this period was influenced by the art of Gustav Klimt and Egon Schiele and then by Max Pechstein, Heinrich Campendonck, Edvard Munch, Henry Moore and Pablo Picasso. ​During this time, seeking to achieve the vivid lighting effects achieved by such Old Masters as Albrecht Altdorfer, Albrecht Dürer, Matthias Grünewald and Martin Schongauer, he revived and adopted the mischtechnik (mixed technique) of painting. In the mischtechnik, egg tempera is used to build up volume, and is then glazed with oil paints mixed with resin, producing a jewel-like effect. Between 1950 and 1961, Fuchs lived mostly in Paris, and made a number of journeys to the United States and Israel. His favourite reading material at the time was the sermons of Meister Eckhart. He also studied the symbolism of the alchemists and read Jung's Psychology of Alchemy. His favourite examples at the time were the mannerists, especially Jacques Callot, and he was also very much influenced by Jan Van Eyck and Jean Fouquet. In 1958 he founded the Galerie Fuchs-Fischoff in Vienna to promote and support the younger painters of the Fantastic Realism school. Together with Friedensreich Hundertwasser and Arnulf Rainer, he founded the Pintorarium. In 1956 he converted to Roman Catholicism (his mother had had him baptized during the war in order to save him from being sent to a concentration camp). In 1957 he entered the Dormition Abbey on Mount Zion where he began work on his monumental Last Supper and devoted himself to producing small sized paintings on religious themes such as Moses and the Burning Bush, culminating in a commission to paint three altar paintings on parchment, the cycle of the Mysteries of the Holy Rosary (1958-61), for the Rosenkranzkirche in Hetzendorf, Vienna. He also deals with contemporary issues in his masterpiece of this period, Psalm 69 (1949-60). (Fuchs, 1978, p. 53). He returned to Vienna in 1961 and had a vision of what he called the verschollener Stil (The Hidden Prime of Styles), the theory of which he set forth in his inspired and grandiose book Architectura Caelestis: Die Bilder des verschollenen Stils (Salzburg, 1966). He also produced several important cycles of prints, such as Unicorn (1950-52), Samson (1960-64), Esther (1964-7) and Sphinx (1966-7; all illustrated in Weis). In 1972 he acquired the derelict Otto Wagner Villa in Hütteldorf, which he restored and transformed. The villa was inaugurated as the Ernst Fuchs Museum in 1988. From 1970 on, he embarked on numerous sculptural projects such as Queen Esther (h. 2.63 m, 1972), located at the entrance to the museum, and also mounted on the radiator cap of the Cadillac at the entrance to the Dalí Museum in Figueras, Catalonia, Spain. From 1974 he became involved in designing stage sets and costumes for the operas of Mozart and Richard Wagner including Die Zauberflöte, Parsifal, and Lohengrin. In 1993 Fuchs was given a retrospective exhibition at the State Russian Museum in St. Petersburg, one of the first Western artists so honored.